These are combined magnetic coolant separator with paper filters. Thus can continuously remove all contamination from coolant like, fine ferromagnetic, abrasives and other non ferrous impurities. 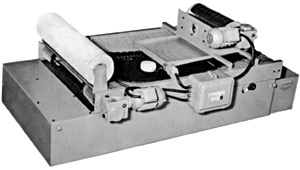 Paper filter is loaded with separate geared motor for automatic feeding. A water level floating gauge is provided with a limit switch. Coolant after magnetic cleaning falls on the paper and by gravity, passes through the paper band leaving behind contamination retained back. As the contamination gets accumulated and liquid level the floater gauge gives signal to geared motor drive and fresh paper is rolled out. Thus the unit is continuously ready for efficient cleaning.